Eddie McFadden, Kenny Burrell, guitar; Donald Bailey, Art Blakey, drums. Throughout his years with Blue Note, Jimmy Smith recorded with his working trio, with guest trios and quartets (usually with Lou Donaldson or Stanley Turrentine, Kenny Burrell and Art Blakey), live club dates often with guest hornmen and even two sessions with singers (for 45 single releases). There were also three very special dates that were marathon jam sessions in the studio built around all-star sextets. The first of these took place on August 25, 1957 with Lee Morgan on trumpet, George Coleman on alto sax, Curtis Fuller on trombone, Eddie McFadden and Kenny Burrell alternating on guitar and Donald Bailey on drums. The second was on February 25, 1958 with Morgan, Lou Donaldson on alto, Tina Brooks on tenor, Burell and McFadden and alternating on drums Bailey and Art Blakey. 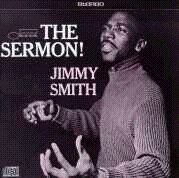 Tracks from these two sessions were intermingled to produce Smith's classic albums The Sermon and Houseparty. In 1979, another album of material came out as Confirmation. And two additional titles were included on a Japanese Blue Note album entitled Special Guests. For compact disc, these sessions have been unravelled and put into their approximate recording order. Just for the record, the third Jimmy Smith jam session took place on March 22, 1960 with Blue Mitchell, Jackie McLean, Ike Quebec, Quentin Warren and Donald Bailey. The results were issued on Plain Talk and Open House several years after the recording date. This compact disc completes the August 1957 session with two standards. "S'Wonderful" is a beautiful Lee Morgan feature with the support of Smith, McFadden and Bailey. "Blue Room" is Curtis Fuller's showcase with only Smith and Bailey behind him. The February 25, 1958 session is here in its entirety. It kicks off with another feature, this one for Lou Donaldson with a gorgeous reading of "Lover Man" with Smith, McFadden and Bailey. The remainder of this date finds Kenny Burrell on guitar and Art Blakey on drums. Lee Morgan returns on trumpet. And he remains on both of these sessions the most exquisite and inventive soloist throughout. On alto is Donaldson, who first began recording for Blue Note as a leader in 1952 and who brought Horace Silver, Blue Mitchell and Grant Green among others to the label's attention. He was a frequent guest artist on Jimmy Smith dates during the organist's entire tenure with the label (1956 to 1963). Tenor saxophonist Tina Brooks was one of the unsung geniuses of the horn. A brilliant soloist with a pure, smooth tone and a mind that created patterns of great intricacy, logic and beauty. Almost his entire output as a sidman and leader was for Blue Note. His obscurity was a tragedy for the music as well as for him. The sextet jams start with two Charlie Parker classics "Confirmation" and "Au Privave." Each offer excellent examples of Tina Brooks' brilliance as well as strong solos from all concerned. The saxophones lay out for a lovely Lee Morgan reading of "Flamingo" which is a tender spot for him and Burrell. The session closes with the magic, rarified track that has become one of the most famous pieces of recorded jazz: "The Sermon," a relaxed twelve-bar blues line inspired by and dedicated to Horace Silver. Time is suspended as all three hornmen, Smith and Burrell weave magnificently soulful and intelligent solos that mesmerize the listener. A classic and a fitting closer. What could one possibly follow it with? --MICHAEL CUSCUNA, from the liner notes.